Do you like trendy shopping? How about cool architecture? Are you interested in Japanese history? In trains? 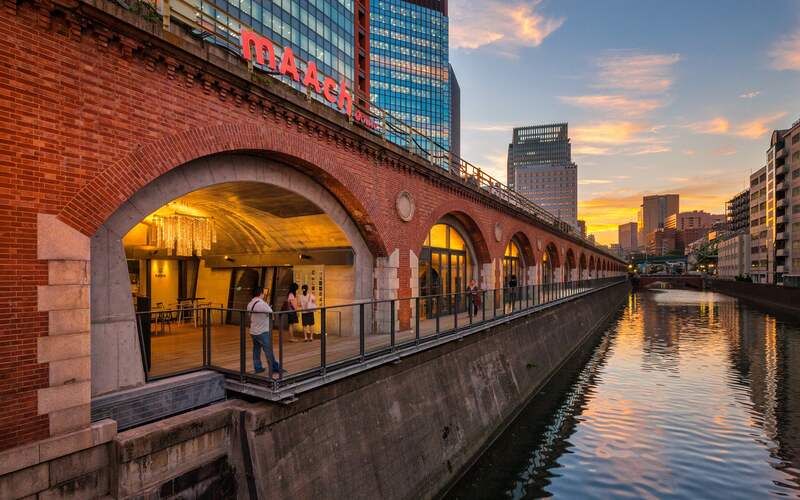 If you answered "yes" to any (or all) of these questions, you'll want to visit mAAch ecute Kanda Manseibashi, a historic Tokyo train station built under a railway bridge that's been converted into a modern shopping mall. Yes, you read that correctly, and it's as fascinating as it sounds. Rarely overcrowded, always changing, and centrally located in busy Akihabara, mAAch ecute is an unexpected treat—and a well-kept secret. Rarely overcrowded, always changing, and centrally located in busy Akihabara, mAAch ecute is an unexpected treat—and a well-kept secret. First, though, a little history. 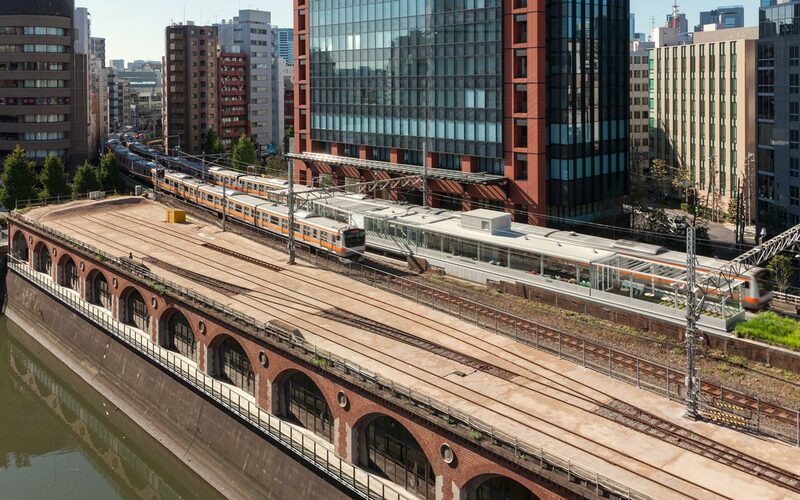 The giant red brick Manseibashi viaduct that hugs the Kanda River in Akihabara was constructed in 1912 as the Manseibashi Train Station, which for many years served as an important hub for Tokyo transit. It was designed by Mr. Tatsuno Kingo (辰野金吾), who also designed Tokyo Station, built two years later—Manseibashi is sometimes referred to as the "older brother" (お兄さん) of Tokyo Station. Manseibashi burned down in 1923 following the Great Kantō Earthquake, was rebuilt, and (while still functioning as a train station) housed a transportation museum starting in 1936. In the early 1940s, as the Pacific War was growing more serious, the number of passengers decreased significantly, and the station closed in 1943. Fast-forward seventy years to 2013, and Manseibashi Station has re-opened as a fully modern commercial retail space, with incredible architecture, interesting cafés and shops, and enough of its historical past still on display to make it interesting and quirky. 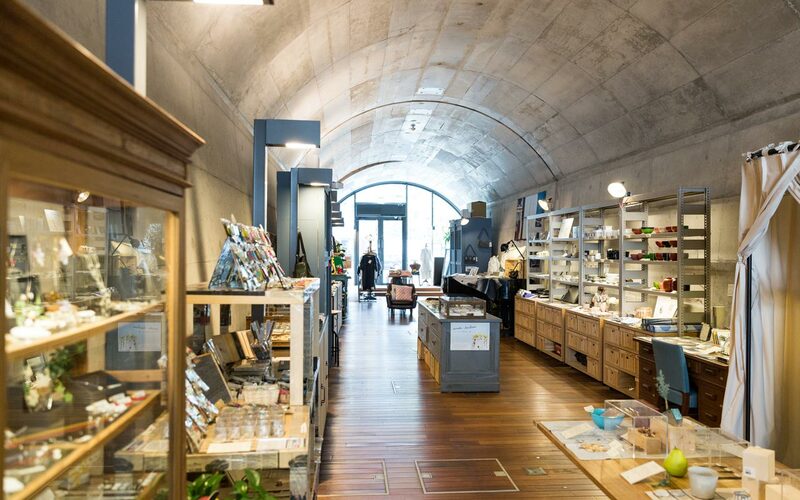 For those in the know, mAAch ecute is a low-stress gathering spot for discerning shoppers, railway nerds, and historians keen on Japanese architecture. Getting there was easy. Following a brief, brisk, walk from Tokyo's JR Akihabara Station, our group gathered beside Manseibashi, the nondescript stone bridge spanning the Kanda River. We had come with a guest: Kotani, the unique and genial Japanese homeless man we had hired earlier that morning for ¥50 (we wrote a whole article about Kotani here). We were all pleasantly chatting, watching the trains come and go on the elevated railroad above us. Below, along the river, in contrast to the bustling Akihabara thoroughfare, it was quiet and calm, and felt easy-going. Then a gate opened at the southern end of the bridge, and the publicist from mAAch ecute, our guide for the day, stepped out to greet us. We introduced ourselves and Kotani, too. Our host was aware that most members of the Tofugu crew aren't Japanese, and seemed to think Kotani wasn't, either: in any case, she was a little shocked to discover he spoke fluent Japanese. This made Kotani happy, and he laughed about it (his laugh is loud, sort of like "BAHAHAHAA!! "), and it set a cheerful tone for the morning's adventure. Not only was mAAch ecute a hit with shoppers, but with train enthusiasts and Japanese history buffs as well. We entered through the gate and under the arches of the railroad bridge. While the exterior of the massive structure is covered in old, weathered brick, the inside has been transformed into a modern, dashing industrial-urban space that had us scrambling for our cameras. Amazing! 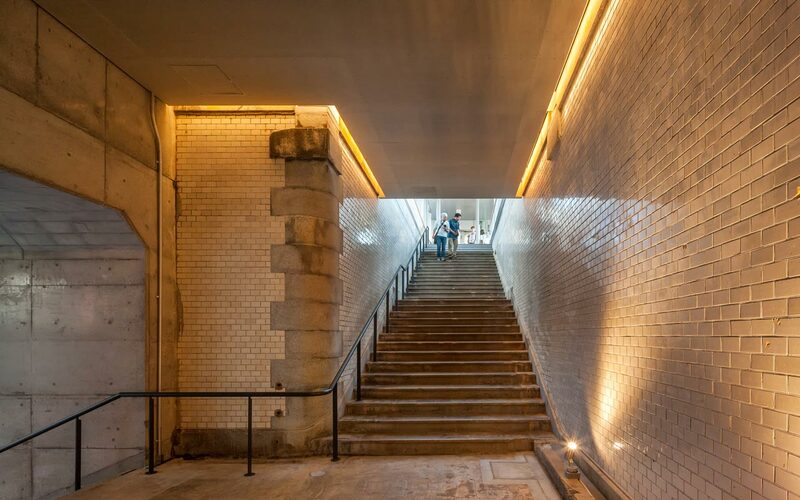 It was a stunning contrast of old and new, with the arches forming a long, continuous central corridor, along which lay a variety of shops and restaurants. Everyone loved it, but Kotani spoke first. "Wow! How stylish!" he exclaimed. "What's the history of this place?" This was great—not only was our companion doing our job for us, he had a knack for coming up with good questions, and with timing as natural as Barbara Walters'. Our guide explained that Manseibashi used to be the main station for the JR Chūō Line, and that while the neighborhood is quiet these days, there was a time when it was as full of life as Ginza, with folks coming to visit nearby movie theaters, shops, and other attractions. 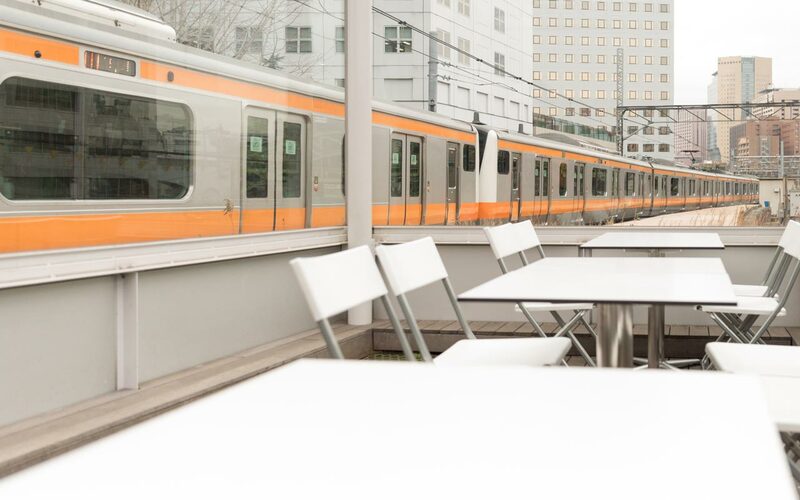 She added that not only was mAAch ecute a hit with shoppers, but with train enthusiasts and Japanese history buffs as well, explaining that even though Manseibashi Station is officially listed as "temporarily closed," it will never be a train station again. But "it still had good bones," she said, and its developer decided to preserve the structure's foundation and exterior, and renovate the inside. The mall opened in September 2013. With our guide assuring us she would show us some remaining details from the old station, we set off on our journey. Just past the front door was the Hitachino microbrewery, but since it was still morning, we decided it may not be the best time for a beer. After a few knowing glances and smiles, we agreed—with a slightly painful reluctance—to return later, and followed our guide and Kotani into this amazing place. 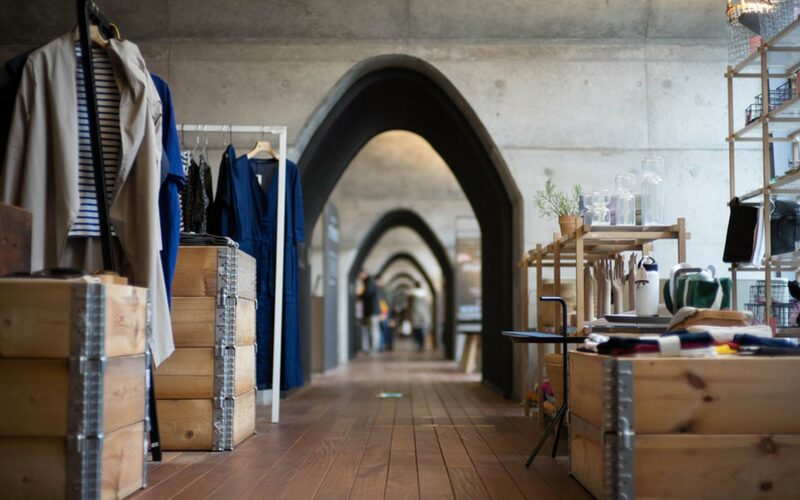 We began our tour in the North Corridor, where a chain of trendy stores lies along the graceful concrete arches. The highlight of the North Corridor is definitely the stunning architecture of these arches, which march on and on into the distance—it was a little like seeing your reflection when standing between two mirrors. We learned that these were actually made entirely of red brick, covered over in concrete to increase their seismic strength. We also learned they are often the backdrop for fashion magazine photoshoots. It made sense! Kotani shouted, "They look really nice!" The first shop we came to was called Haluta, which sells Nordic vintage furniture, tableware, dishes, and dry goods. Mami loves Scandinavian style, so the store's selection made her heart do a polska. Although some shops are permanent, others exist for a limited time only; we saw an event space for pop-up stores that may be open for only a single day. 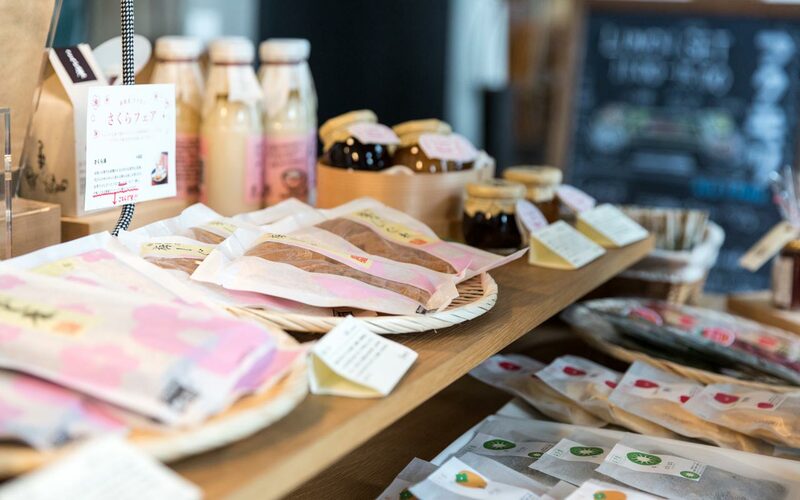 As a shopper, you may walk into mAAch ecute one day to find a store for local designers and, when you return six months later, find a local foods grocer has set up shop in the same place. Because the roster is constantly changing, you'll never run out of new things to see. Also, mAAch ecute definitely sets its own priorities. 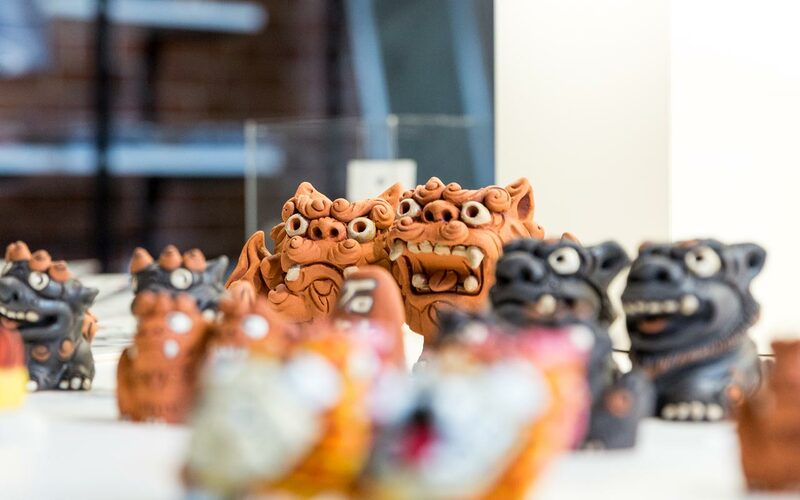 The day we visited—in contrast to much of Tokyo, which was celebrating the opening of the Hokkaido Shinkansen, just ten days away—it was hosting an Okinawan fair. Whatever it chooses to promote, mAAch ecute regularly updates its event information and a list of its current businesses on its website. 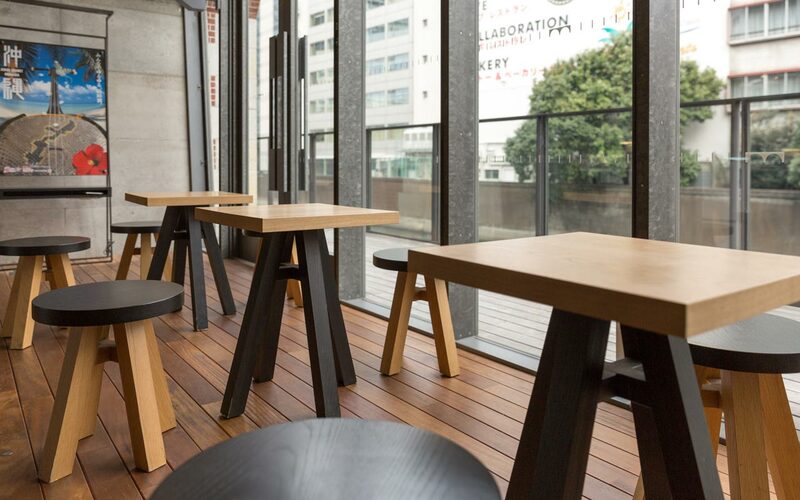 From the event space, we stepped outside onto the beautiful waterfront deck that runs parallel to the Kanda River. Our guide explained that the developers wanted to create a water-friendly place, with a relaxing ambience and the easy-going feeling we had felt earlier, looking down to the river from the street. Although the water is green-hued and buildings face it from the other shore, the deck felt peaceful and serene—a welcome contrast from the hustle and bustle of the city around us. The library held a few rare books, but even more fascinating to us was a large diorama depicting the station (and the streets around it) in the days of its opening. As we strolled along the deck, we wondered aloud about the curious name for this reborn train station. Mami asked our guide if the "A's" in "mAAch" were capitalized to symbolize the concrete arches. Pretty close: they symbolize gates to welcome customers through. 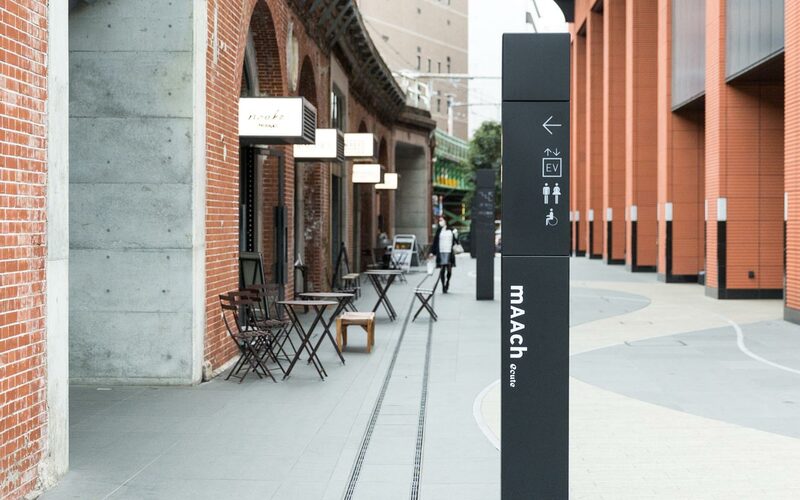 We also learned that "mAAch" has two different meanings: one is "machi" (街/city), which reflects the developer's desire to build a space within Tokyo as a way to help revitalize its economy; the other is "march"—as in a "merry march onward" in time with an excited, beating heart. eki (駅), which means "station"
In the middle of the station, all people can enjoy it (together). That sounded like a pretty accurate description to us! Also, the mAAch ecute logo was designed by Sano Kenjirō (佐野研二郎), who designed the Tokyo 2020 Olympics logo. Interesting! 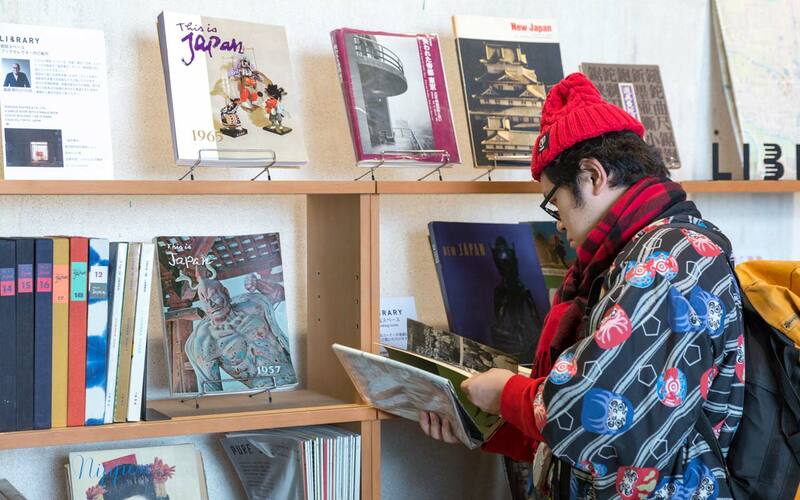 Between the event space and the next shop, we were ushered into a small library full of information about Japanese traditional goods and the history of Manseibashi Station. The library held a few rare books, but even more fascinating to us was a large diorama depicting the station (and the streets around it) in the days of its opening. The piece was very detailed. In 1912, Western culture was still new to Japan, so in the diorama, some figures are wearing Japanese clothing while others are in Western garb—the artists must have looked at hundreds of photos from that period. Also, the brightness of the light in the diorama changes to depict the time of day at the station: morning, afternoon, evening, or night. 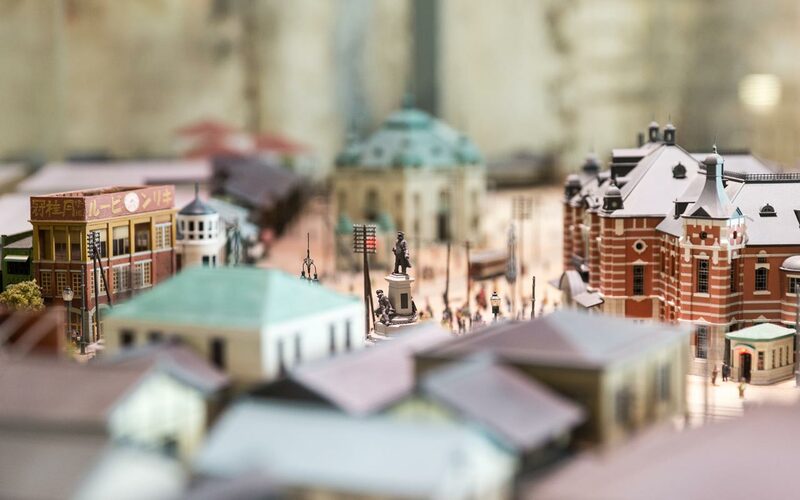 One element in the diorama is somewhat controversial: in front of the station is a tiny statue of Lieutenant Colonel Hirose and Warrant Officer Gugino—war heroes of the time, who died during the Russo-Japanese War. Some people who prefer not to focus on the war have been offended by this detail. The library also has a little shop that sells made-in-Japan goods as well as mAAch ecute omiyage. This includes certain items you can only buy here: postcards, dorayaki pancakes, books, maps, train station stamps, and more. The shop is permanent—which means you can count on it being there next time you return. Another permanent shop on the North Corridor is a Yamagata-themed shop/grocery store/café called Fukumori. We were getting hungry, but we had planned to eat lunch at N331, the upstairs station café—it's a really cool place!—so we had to wait. There were more shops after Fukumori, but all of them were open only for a limited time (so they're long gone by now). But there are new shops opening (and closing) all the time! During our visit, we discovered a place selling handcrafted items and a unique clothing boutique where Kotani found his favorite denim apron. (Doesn't everyone have a favorite denim apron?) When he found it, he shouted, "BAHAHAHAA!" In contrast to the North Corridor, the South Corridor felt like a funky urban street lined with tiny shops, as well as plenty of food options. The day we visited, it featured a bakery (which was temporary), a sweets shop called NOAKE TOKYO, and three restaurants: one with a Chinese menu; a second called Sea Foods Creative, whose cuisine featured 塩辛 (salted seafood) and Japanese sake; and a fish broth ramen shop called Mugi to Olive. NOAKE TOKYO was a wonderful place. 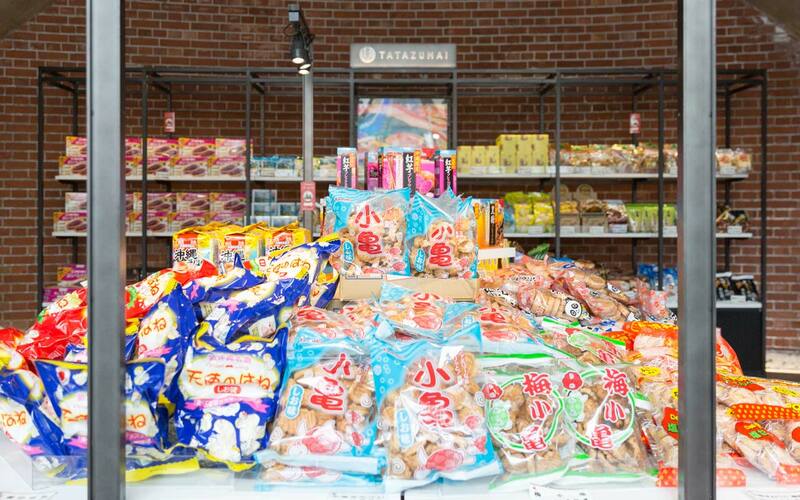 Their sweets are a fusion of Western and Japanese traditional confections. Two examples? They sell powdered cotton candies called Kumoka (雲菓), whose design is very different from typical cotton candy, and also a type of French shortbread called sablés, which they call "porte-bonheur" ( or "lucky charms" in French). As the name suggests, porte-bonheur are shaped like rabbits, dogs, or cherry blossoms—things that are traditionally considered lucky in Japan. They were so cute! More History, a Little Architecture, and… Trains! After checking out the shops and eateries, our guide pointed us to the station's historical spots. We started with the staircases, of which mAAch ecute has two. 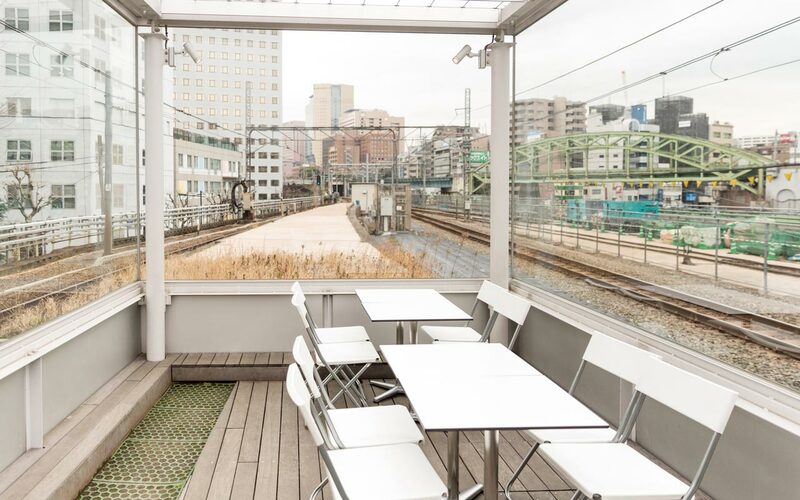 The observation deck is the coolest spot in Manseibashi Station… it's our favorite secret spot to visit in Akihabara. Shhhhhh… please don't tell anyone! 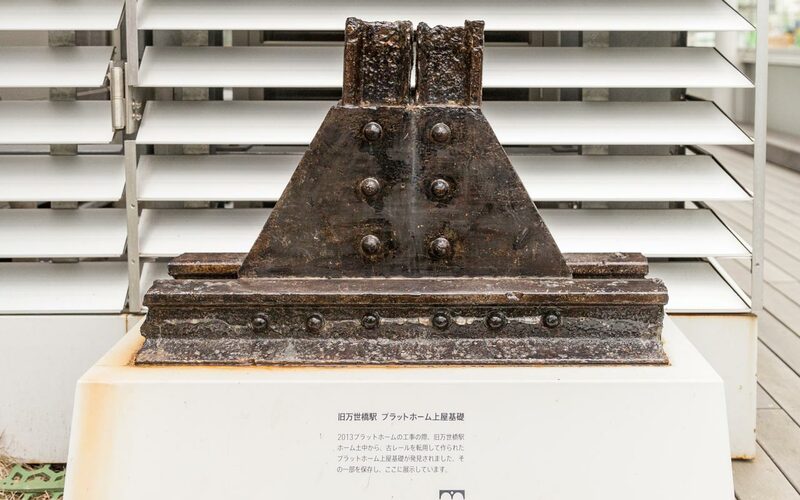 The oldest staircase, built in 1912, was part of the original red brick Manseibashi Station. Back then, Manseibashi was located next to what is now mAAch ecute, and passengers would pass through ticket gates, then climb the stairway—which was built in the middle of the station—up to the train platforms. Today, although some parts of the stairway have been renovated, the walls are still original. They haven't even been washed—visitors can see and feel (and sometimes smell) their long history. The floor tiles at Manseibashi are original, too. Made of hand-cut stone, all the tiles were laid by hand, and it's said that the work reflected the best (and most difficult) technique of the craftsman of that time. Look closely and this will be obvious. The tiles were set using a technique called "Fukurin/Fukuwa Meji" (覆輪目地), which means "curved recessed joint," "concave joint," or "rodded joint." With this technique, the joint between two tiles bulges a little bit, with a semicircular shape like kamaboko. Nowadays, the only other place to see this kind of workmanship is at Tokyo Station's Marunouchi Station building. But there's also a second set of stairs, built in 1935. After Tokyo Station was constructed and the Chūō Line extended to it, ridership at Manseibashi began to decrease. 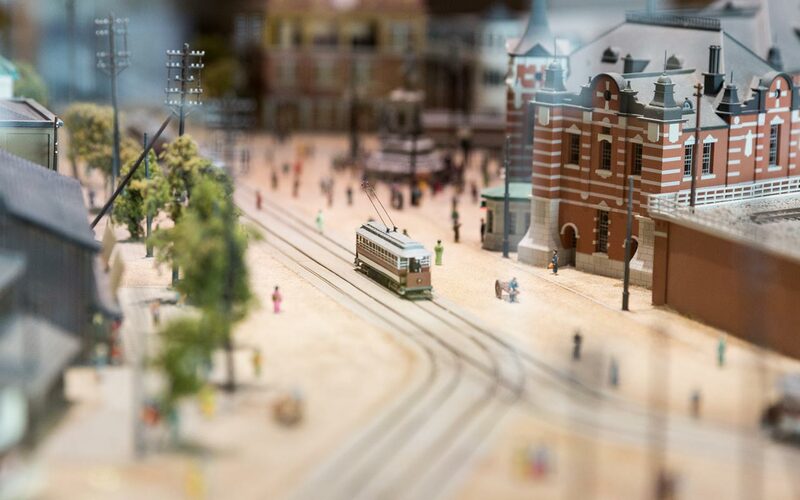 To bring people to the station, Tokyo built the Transport Museum here, which opened in 1936. Built at the side of Manseibashi, the new stairway served this arrangement better. 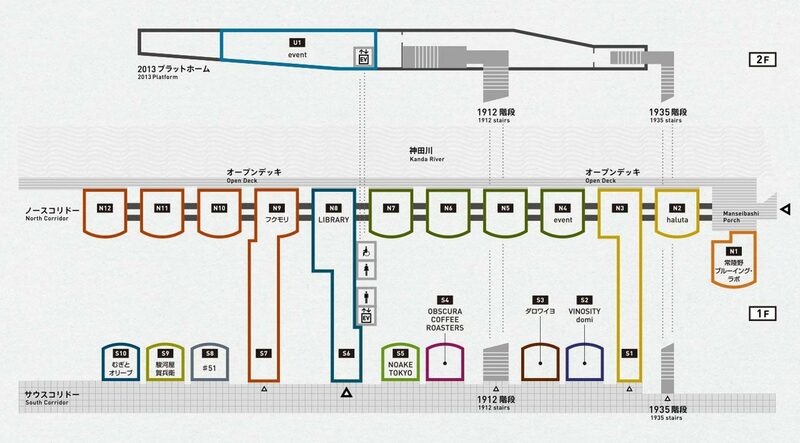 Today, it provides an excellent view of shops on the first floor—and a good overview of the whole building. 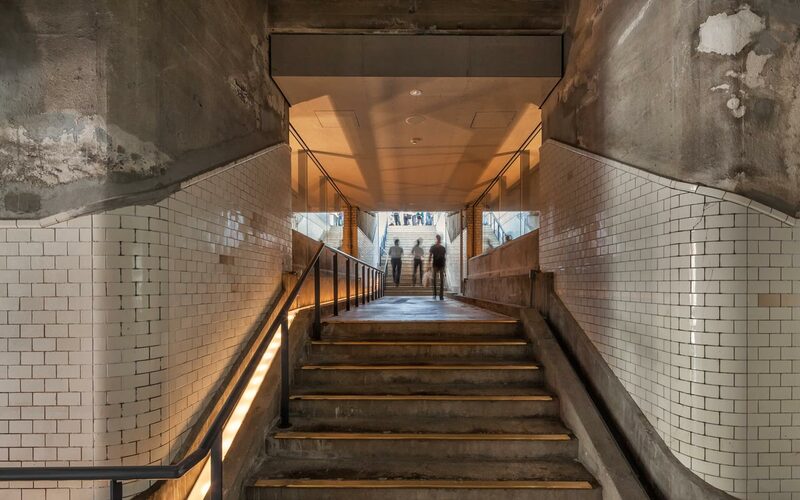 This "newer" stairway feels historic, too, but in a different way. Its wall are still home to some original posters from the 1940s—neat!—which promote the "priority transportation enhancement movement." That might sound positive, but it actually encouraged Tokyo citizens to refrain from using transportation for travel or commuting purposes in order to help Japan's war effort. Look closer, and you'll see another war-related detail: all the original metal fittings along the edge of the steps were removed and used for war materials, replaced years later with the gold-colored metal fittings you see today. You can find more information and images about the station's history on digital displays near these stairways. After exploring the historic staircases, we finally made it up to the observation deck at the top of mAAch ecute. No longer a working train platform, this new area offers a stunning view of the train line that once served it. Just as we arrived, a pair of trains—a rapid and Chūō Line train—zoomed past at the same time, which apparently only happens occasionally. We were lucky! There were once four rail lines up here, but only two are in use now. There used to be two platforms, too, but one was demolished many years ago. And while the one that remains isn't used as an actual train platform anymore, we were strictly warned that "no camera flashes are allowed" while on the platform. Actual trains still pass by, and their operators could mistake a camera flash for a signal. The result could be disastrous. While the station name plate still reads "Manseibashi," the former train platform has many uses. That day, it was home to the excellent N331 café, which we adored! N331 was a very cool place, where you can enjoy good food while watching the trains. (There's a new restaurant there now, Platinum Fish, but it opened after our visit.) Kotani also discovered that there was free Wi-Fi up on the observation deck, and said it was 最高/saikou! (Awesome!) He told us it's important to let foreign travelers, and Japanese tourists, know about free Wi-Fi spots. We agree! No matter what kind of shop shares it, though, the observation deck is the coolest part of Manseibashi Station. If you want to eat something, just bring your bento box. You can still sit and relax as you watch trains come and go. We totally recommend coming here—it's our favorite secret spot to visit in Akihabara. Shhhhhh… please don't tell anyone! 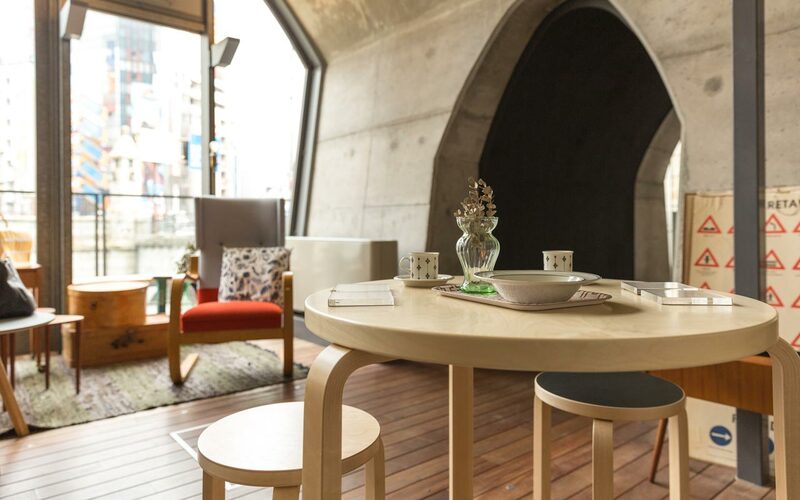 There are so many reasons to visit this amazing rebirth of a classic Tokyo landmark. If for no other reason, it's very rare: most of the old stations have been closed down, and a place with this much history is very hard to find. It's also incredibly unique, with classic design transformed into a shopping mall. 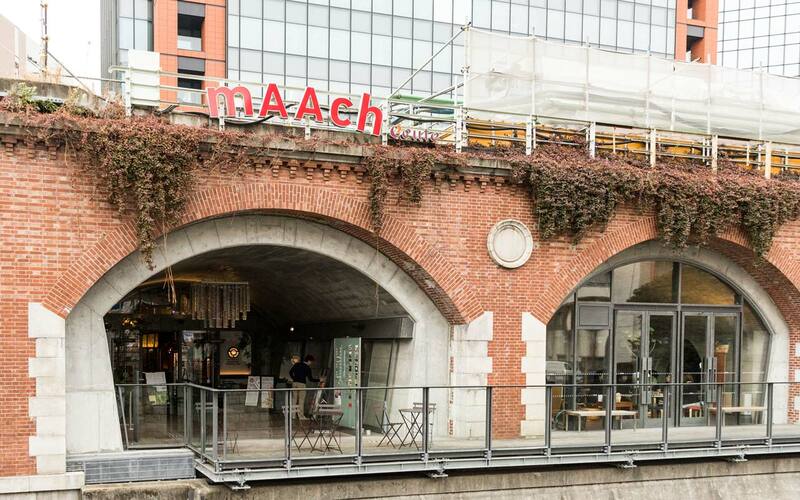 Being built into the underside of a bridge, you might think it would be gloomy or dangerous, but in reality mAAch ecute offers a totally fresh commercial take on this fascinating, historic megastructure. Also, don't forget that if you find something to buy, mAACh ecute is tax free for foreign tourists! We came away that day with a renewed appreciation for unexpected gems like this, which are tucked away all over Japan. 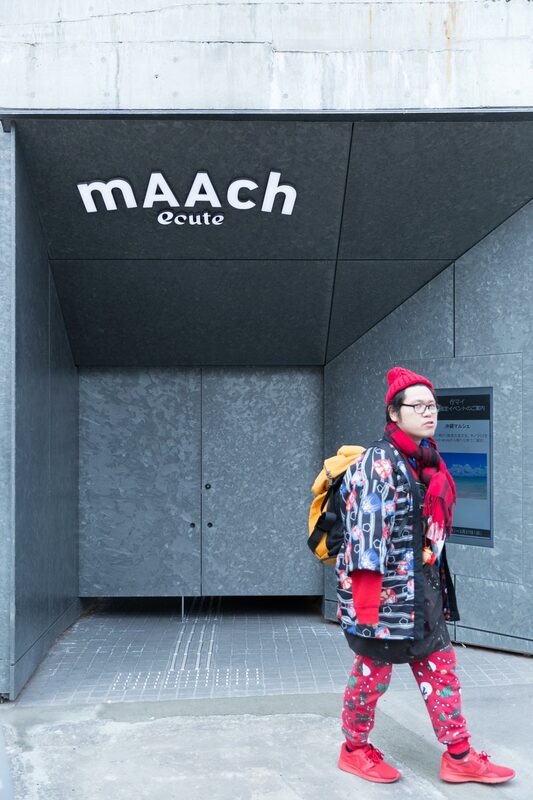 Our hired guest loved it, too: this was Kotani's first time visiting mAAch ecute, and when he heard it was Koichi's second, he couldn't believe it. "Second time?" he exclaimed. "You know a lot of cool places! You're more Japanese-y than actual Japanese people! BAHAHAHAA!" Nice relaxing place in busy Akihabara. It’s cool that new shops are appearing all the time, but it’s not cool that your favorite shop may not be there next time you go. Case in point: I was sad to learn the platform café has since closed. Although the observation deck is still there, I liked eating yummy stuff from the café while watching the trains pass by. Cute little shopping strip away from the visually busy Akihabara. If you are into microbrews, there is a Hitachino brewery at mAAch. A few things have changed since this article has been written (some stores have come and gone), so please keep that in mind. I prefer little shopping areas like these over their bigger counterparts. The quality and uniqueness of the goods sold make mAAch ecute a worthwhile place to visit. I probably find myself here once every year or two, and I’m always excited to see what new shops have popped up—sometimes literal pop-up shops—since my last time there.